The Table Tracker Order View allows you to filter and sort orders in different ways. Table Tracker orders are categorized into two types — Dine In and To Go. The type is determined when an order is started on either a Dine In starter (the green starter labeled "Start") or the To-Go starter (the blue starter labeled "To-Go"). The view selection can be found in the top navigation of the Order View. 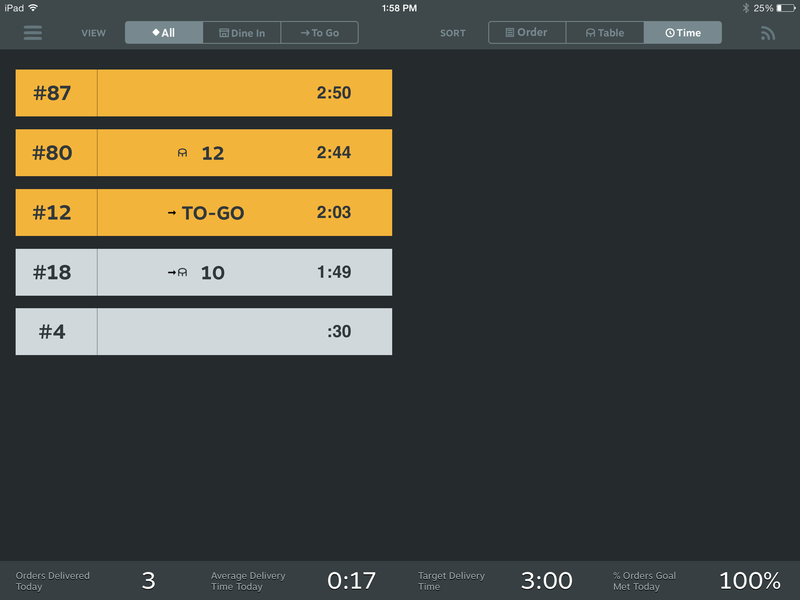 Using View selection allows you to see all order types, only Dine In orders, or only To-Go orders. Many restaurants find this useful when they are deploying multiple displays at different areas of the restaurant. Similar to the View Selection, Sort options are located in the top navigation of the Order View. You have the option of sorting your orders by time in descending order, by order number in ascending order, or by table number in ascending order followed by empty table assignment and then To-Go Orders. By default your Table Tracker application is set to sort by Time. Many restaurant staff members use the sorting feature as a way to quickly identify a particular Order or Table .